I have to tell you, this was the project that I needed right now. Having an excuse to sit down on the couch every night has been such a relief. I am not the best hand quilter out there (by far! ), but I see many more hand quilting projects in my future. This quilt top has been finished for a couple weeks and I started right in on the hand quilting. And once I was done, I went back and made the quilting twice as dense because I wasn't done having an excuse to sit on the couch. The pattern is from Jen Kingwell's amazing book Quilt Lovely and the colors were inspired by a stack of fabric that I ordered from Lark Cottons. My favorite print is actually on the back. It is a Lisa Congdon voile and it is light and soft. 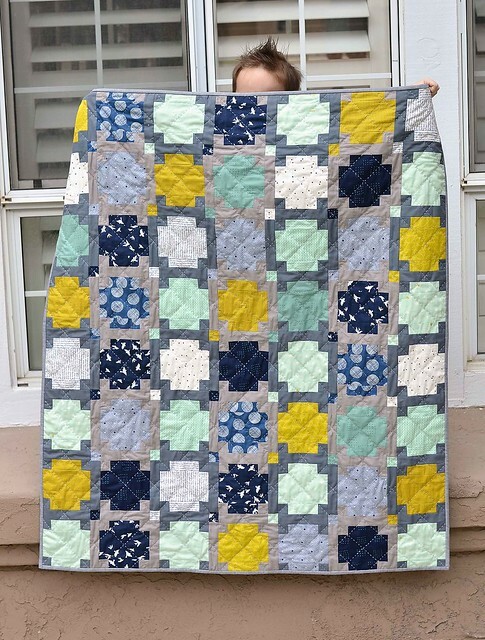 My goal was to make this quilt as lightweight and drapey as possible, while still having it be warm and cuddly. The voile on the back helped with that and so did the hand quilting, but I also used Quilter's Dream bamboo batting for the first time and I am in LOVE! It is a little fluffier than cotton, but very lightweight. I will definitely be using it again. Beautiful quilt - I cannot imagine myself hand quilting anything. I am working on an embroidery project and can only work every other day or so because my wrist and fingers wear out to fast. This is a true labor of love. Beautiful quilt! 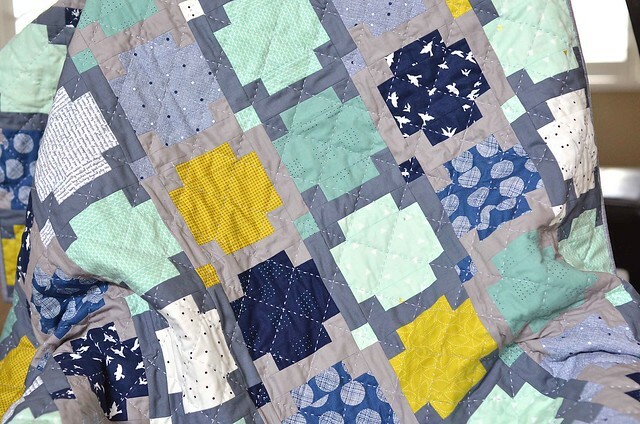 I love the pattern, the fabrics, and your hand quilting is lovely. I need to give hand quilting a try. what thread did you use? it is so lovely! Love the colors and that back is perfect! This looks really amazing! Your fabric choices, the design, the backing, and the quilting! all go together in just the best possible way! I've been thinking about doing the same type of hand quilting because I like the look of the beefier thread. What did you use to quilt it? i can just imagine how wonderfully soft it will be with voile and the bamboo batting! 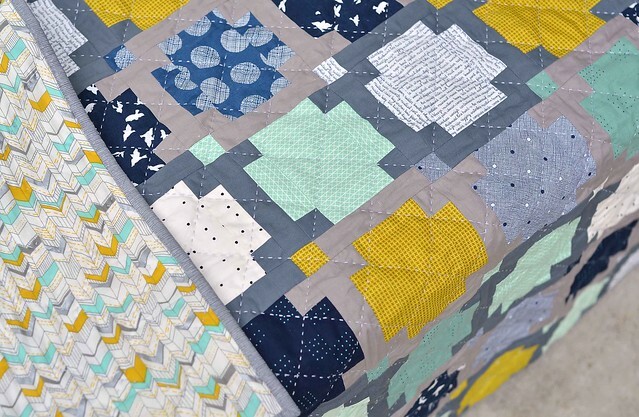 What a dreamy quilt this is! I love the hand work part of the quilt almost the most. I am always sad when the binding is done. Beautiful quilt. I look forward to seeing it in the flesh! Fabulous. I keep telling myself I won't buy Quilt Lovely but I have seen nothing but positive comments about it so I may yet change my mind! This is so cute and perfect for a baby boy! I love hand sewing, it gives me an excuse to put my feet up! Beautiful ! I love your choice of colours. I'll keep it in mind for a future project ;-) Usually hand quilting is soft and comfortable. what a beautiful quilt, and what a lot of hand quilting! So pretty! I love your fabric choices and the pattern is beautiful. to stop your fingers getting too sore to quilt? Congratulations on having hand quilted this. As a mom with three young children your time to quilt must be limited so the commitment to hand quilt is significant. You made a lovely quilt.